After you have added a flow path to a workflow diagram, you can specify the path type. For details on adding flow paths to a workflow, see Section 6.3, Adding Flow Paths. Click the flow path in the workflow diagram. Set the flow type on the Properties tab by selecting one of the options in the Type drop-down list. Forwards control to the next activity in a workflow. Determines what happens when a user approves a request. The approved flow path is valid only after the Approval activity. Determines what happens when a user denies a request. 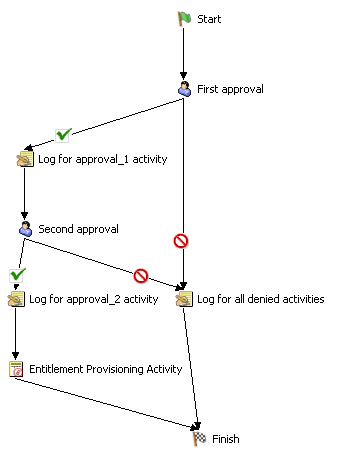 The denied flow path is valid only after the Approval activity. Determines what happens when a user refuses a request. The refused flow path is valid only after the Approval activity. Determines what happens when an Approval activity times out because the user did not respond. The timedout flow path is valid only after the Approval activity. 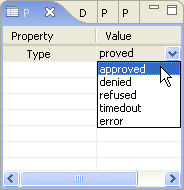 Determines what happens when an Approval or Condition activity terminates with an error. The error flow path is valid only after the Approval and Condition activities. Determines what happens when a conditional expression evaluates to True. The True flow path is valid only after the Condition activity. Determines what happens when a conditional expression evaluates to False. The False flow path is valid only after the Condition activity. If the Properties tab is not displayed, right-click the flow path in the workflow diagram and select Show Properties.